Is yours the same before I take the plunge and get this kit?? Yes, it's how the designer intended it. I don't see it as an issue, night fighter Blenheims often had the panels over-painted (I would guess to reduce flash from the guns being fired). There's photos of the 54 OTU machine having the panels over-painted, although I'm not sure about the 23 Squadron machine. The instructions show clear panels for both aircraft, but I believe that is erroneous, other than for depicting the 23 Squadron machine as G-BPIV currently operating from Duxford. The frosting is not especially heavy, it shouldn't be at all difficult to polish out if you want to have a clear panel. To be honest, I'm wondering what all the fuss is about, the kit looks superb, Airfix firing on all cylinders. They're mostly by Aoshima who do a whole series of Thunderbirds kits. They're not cheap, averaging out at £30-£40 a pop, but I'm fortunate to be able to indulge myself. The two TB-1s and the TB-2 are the old Imai kits. There's two TB-1s because the kit is compromised in that they build into push-along toys. With two kits there's enough parts to complete one flying model I also recently managed to acquire an Aoshima TB-1, this is far superior to the Imai kits and features an undecarriage. You should find most of these if you do an ebay search. That's for your help, hope I wasn't a nuisance and making too much of a fuss?? I'm guessing that these need to be constructed and painted? What scale are they? Are they not sold in the UK, as there appears to be writing on the boxes that I cannot read? Yes, they're pretty much regular plastic kits, although some have motorised features and contain parts for motorisation. Some offer screw together components, the big TB-2 has main parts that are screwed as well as glue. Scales are variable. They originate from Japan and have Japanese text on the boxes. They are fairly limited in availability in the UK/Europe, I've been ebaying some (you might be able to buy direct in some cases), others I've been getting from a couple of Facebook sellers who order them in if they become available. What‽ Any excuse to rummage about in a huge box of plastic parts is always welcome here! So if the scales are variable, they are not made to a particular scale and one kit called be smaller / taller to another. So the kits might look odd together, which is not something one wants, due to these kits all being Thunderbirds themed. They are supposed to go together! So they not officially sold in the UK, as they are Japanese imports. I suppose you could import them to the UK yourself, depending on how expensive / cheap the postage is from Japan to the UK, but there is a risk of having import fees upon delivery of the parcel. I am guessing then that Aoshima is a Japanese kit manufacturer then? If I am correct here, I have never heard of them! Please post images some on this forum when you complete them. I would love to see them. Typo on my post was supposed to be THANKS, not That's at the start of my reply!! But yes I enjoy going into my loft and going through my stash as well but I end up with another pile that I want to add to my build schedule! Not enough hours in the day to do them all lol !! I had been contemplating this kit for a long while due to the cost so researched it first as its probably the most I've ever spent on a kit. But I've always loved the RAF Coastal command Liberator and wanted 1, but unfortunately Airfix's B-24 is now too dated and would probably be too difficult (for me) to convert . I got a set of 10 Vallejo Model Air Coastal Command colours which I think makes it good value!! 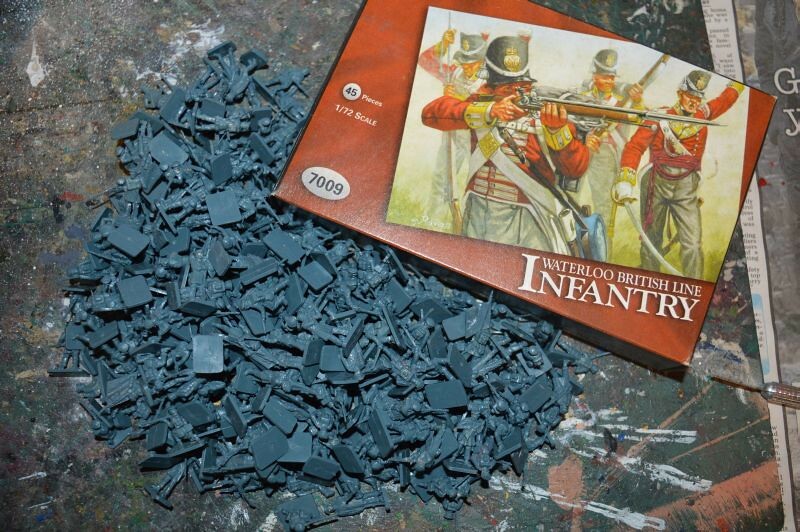 A couple of e-bay wins - 278 x Airfix 01756 Prussian Infantry and 01745 in the HäT box.